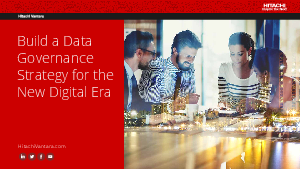 > Hitachi Vantara > Build a Data Governance Strategy for the New Digital Era. Digital transformation is disrupting traditional, tried-and-true business process and leaving many enterprises scrambling for alternatives. Although the customer remains king for business success, data is quickly becoming an organization’s most strategic asset for reaching, interacting with and retaining customers. With ransomware attacks on the rise, a strict regulatory environment, and nimble, competitive upstarts entering the market, protecting and extracting value from your most strategic asset is a business imperative — and a formidable challenge.